Gun Vault . . . Rifles available for IMMEDIATE DELIVERY! 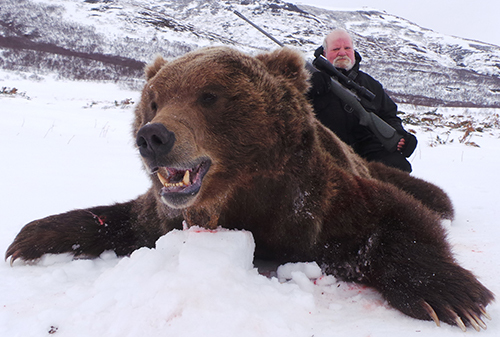 Kenny Jarrett, Owner & President, with his Russia bear kill. 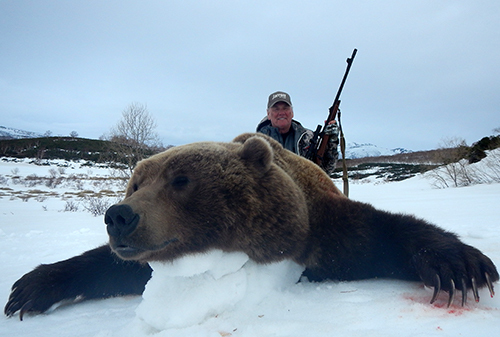 Bill Martin, with his Jarrett rifle and Russia bear kill. Welcome to Jarrett Rifles, creators of exquisite firearms universally lauded as the “World’s Most Accurate Hunting Rifles”. Through the acquisition of a Jarrett Rifle, you are assured that all your requirements will be met in a firearm purpose built for your hunting style, your game and your specific goals. Today, thousands of discriminating sportsmen enjoy greater hunting success due to the unrivaled performance of their Jarrett rifle. Their countless trophies and World Records are testaments to Kenny Jarrett’s engineering innovations resulting from his quest to produce outstanding accuracy and reliability in every Jarrett rifle model. Through his unrelenting dedication to the perfection of the hunting rifle, Kenny Jarrett has become an American firearms legend. We appreciate your visit to our enhanced website and hope you enjoy the many new features developed to more fully explore the development and manufacture of Jarrett Rifles. An important addition to the site is The Jarrett Difference, in which Kenny explains the development of a Jarrett rifle’s unique features that separate it from all custom makers’ or large manufacturers’ production rifles. The Gallery section features new photography of our rifles, and the Trophy Room shows our clients’ trophies from around the world. The helpful ammunition commentary, Pet Calibers, a distillation of Kenny’s experience with various brands and calibers of ammunition, now appears under the Jarrett Ammunition heading. Gun Vault, a description of guns for immediate sale, now features photos of each gun available. Check out our Gunsmith page for repairs, upgrades and improvements for all your firearms, including precision AR accurizing. We look forward to your call (803.471.3616) or email. 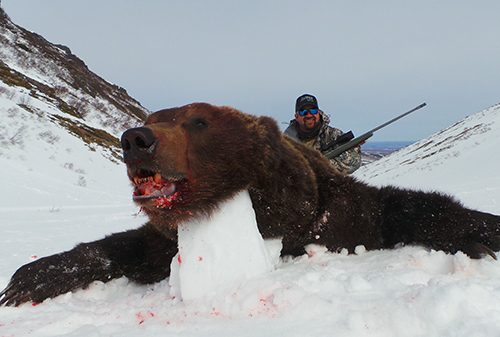 It is our pleasure to answer your questions about the perfect Jarrett rifle model for your next hunt, our handloaded Trophy & Safari Ammunition, our powerful Jarrett Jackhammer Solids and the expert gunsmithing services we offer. Experience The Jarrett Difference with the purchase of a rifle designed and built by America’s legendary firearms craftsmen, Kenny Jarrett, and increase your shooting enjoyment and success next hunting season!